EMA-EUnetHTA Parallel Consultations: In parallel between HTA bodies and regulators (EMA). Consolidated Parallel Consultation (PCC): Provides consolidated recommendations from all participating HTA bodies. Coordinated by the EUnetHTA ED Secretariat. Detailed information regarding Parallel Consultations (including the EUnetHTA-EMA Guidance document on Parallel Consultations, necessary templates, etc.) is available on the Parallel Consultations page of this website. Individual Parallel Consultation (PCI): Provides individual recommendations from each participating HTA body. Facilitated by the EUnetHTA ED Secretariat. EUnetHTA Multi-HTA EDs: An Early Dialogue taking into account the opinions of HTA bodies only. Multi-HTA EDs provide consolidated recommendations from all participating HTA bodies. Coordinated by the EUnetHTA ED Secretariat. Detailed information regarding Multi-HTA EDs (including the EUnetHTA Guidance document, necessary templates, etc.) is available on the Multi-HTA ED page of this website. The decision to pursue a Parallel Consultation or a Multi-HTA ED is up to the Applicant. Assessment of Early Dialogue requests against the predefined Eligibility Criteria for an Early Dialogue on pharmaceutical products. Provide feedback to the EUnetHTA ED Secretariat regarding procedural and template revisions. Take turns acting as Scientific Coordinator and Rapporteur for EUnetHTA EDs in order to facilitate cooperation amongst participating HTA bodies, thus increasing the proportion and quality of common recommendations to the company. The EDWP aims to ensure the constant quality of EDs while providing sufficient flexibility to allow for participation of additional HTA bodies from across Europe. This will allow the participation of agencies of various sizes in the process, while ensuring that all contributors have the necessary level of expertise and comply with the JA3 procedures. Regardless of the ED type (PCC/PCI/multi-HTA) HTA bodies that are not members of the EDWP are systematically invited to participate. Once a decision is made by the EDWP regarding the pathway of a parallel consultation or the acceptance of a multi-HTA ED, a call for participating is sent out to all partners. The final group of HTA bodies participating in a specific ED will constitute the ED Committee (EDC). This group is composed of the EDWP + any other participating HTA body. The EDC is led by the ED Scientific Coordinator for this ED. The make-up of the group will thus vary for each ED. While the choice of what type of ED (Parallel Consultation vs. Multi-HTA) is up to the Applicant, the decision as to the pathway for a Parallel Consultation and the acceptance (or not) or a request for a Multi-HTA ED is up to the EDWP. AND responding to unmet need (no treatment or only unsatisfactory treatment available). The graphic below illustrates the options for pharmaceutical Early Dialogues. The EUnetHTA ED Secretariat (EUnetHTA-HAS@has-sante.fr) is available for any additional information companies may need to take their decisions on the type of ED they should request. A « EUnetHTA Early Dialogue » is an ED for which EUnetHTA partners may use their project budget to participate. 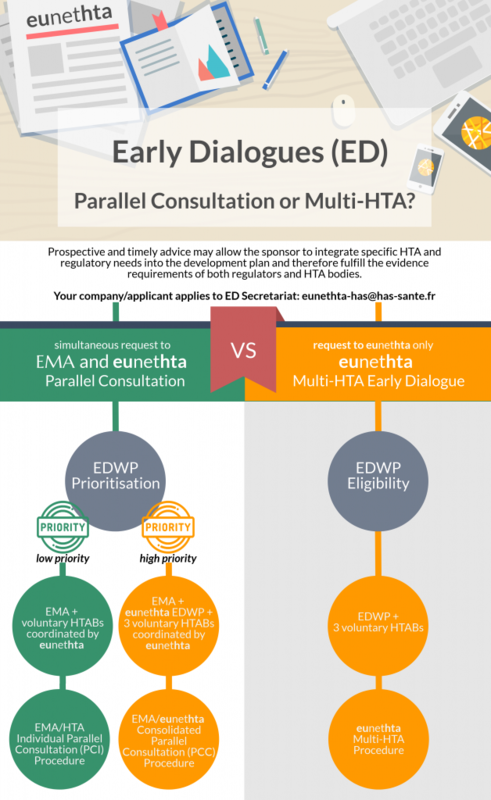 Only Consolidated Parallel Consultations and Multi-HTA Early Dialogues are considered “EUnetHTA EDs”.